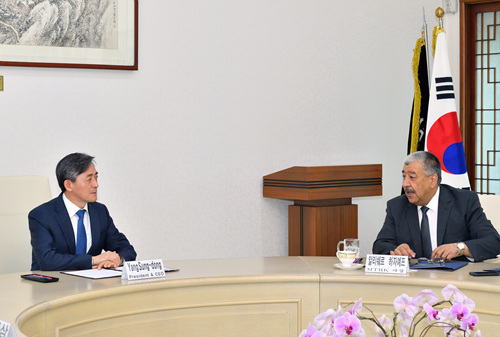 KBS President and CEO Yang Sung-dong(left) agrees to continue efforts to strengthen co-operation with MTRK in a meeting with MTRK General Director Alisher Khadjaev. KBS President and CEO Yang Sung-dong(second from right) welcomes a high-profile delegation from MTRK. 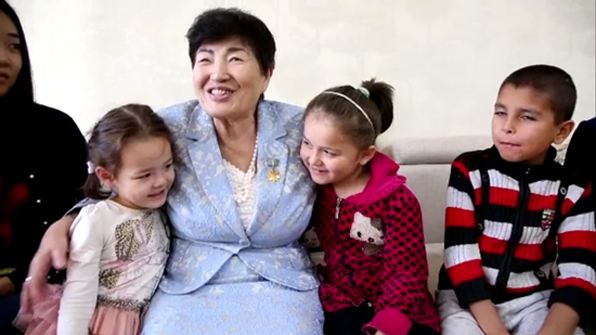 A scene from Sasha's Arirang, a documentary co-produced by KBS Special and NAEMM, Uzbekistan. KBS and MTRK(National Television and Radio Company of Uzbekistan) have agreed to continue their efforts to further promote mutual co-operation, particularly in the area of documentary co-production. 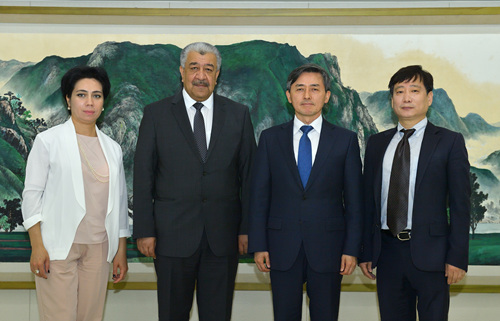 In a meeting with KBS President and CEO Yang Sung-dong at KBS Headquarters on 24 May 2018, General Director Alisher Khadjaev of MTRK expressed a strong interest in developing a documentary co-production initiative based on the Memorandum of Understanding signed in August 2013 between KBS and MTRK. Mr. Alisher Khadjaev said he hopes to illuminate the lives of ethnic Koreans in Uzbekistan as well as Uzbekistanis currently living in Korea through the proposed documentary co-production. He said he would also like to create a documentary on Presidents of Korea and Uzbekistan that explores co-operative ties between the two countries in co-operation with KBS. Mr. Alisher Khadjaev added that MTRK hopes to benchmark various aspects of broadcasting and content production of KBS. Mr. Yang Sung-dong cordially welcomed the MTRK delegation and agreed that KBS and MTRK have much to exchange through the Asia-Pacific Broadcasting Union(ABU). Mr. Yang said the proposed documentary co-production on the two countries will be even more significant as there will be an increase in exchanges between Korea and the countries in Central Asia amid the peace prospects for the Korean Peninsula in the light of recent developments. Also, Mr. Yang stressed that he is well aware of ethnic Koreans in Uzbekistan and KBS had broadcast a two-part documentary on the history and lives of these Koreans. Co-produced by KBS’ flagship documentary program KBS Special and the National Association of Electronic Mass Media(NAEMM) in Uzbekistan, the special documentary programs titled Sasha's Arirang and Uzbekistanis' Korean Dream were aired via KBS TV1 in December 2017 and March this year respectively in commemoration of 80 years of history of Koreans’ deportation in Central Asia. He added that he is optimistic about the proposed co-production as it will look into various areas of the two countries and introduced a KBS program titled My Neighbor, Charles. A female guest from Uzbekistan appears in the reality-variety show. As KBS is hosting this year’s PBI Conference in Seoul from 23 to 25 of October, Mr. Yang offered a briefing on the PBI Seoul 2018 and invited Mr. Alisher Khadjaev to join the annual forum for public service media to share creative strategies and visions for the future.